IRRI Training is currently conducting a two-week molecular breeding course from 22 September to 3 October at IRRI Headquarters, Philippines. The course covers the latest computer software used in molecular breeding and provides a holistic training on the latest molecular technologies that can be applied in developing high-yielding rice varieties that are not just resistant to various biotic and abiotic stresses but also has improved grain and nutritional quality. This year’s course has 19 participants that include rice scientists and researchers from Cambodia, India, Indonesia, Madagascar, Myanmar, Nigeria, Philippines, South Korea, Thailand, Uganda, and Vietnam. The molecular breeding course is coordinated by Dr. Joong Hyoun Chin and Ms. Mayee Reveche of the Plant Breeding, Genetics and Biotechnology Division. The course is facilitated by Ms. Angie Maghuyop of the Training Center. IRRI calls on ASEAN to build a new generation of rice scientists and extension professionals. According to V. Bruce J. Tolentino, deputy director general for communication and partnerships, these efforts will help ensure secure and stable rice supplies across ASEAN and the world. The proposal calling for more support for science education and extension was presented during a series of high-level meetings with the ministers and senior officials of the ASEAN Ministries of Agriculture and Forestry (AMAF) on 20-26 September in Naypyitaw, Myanmar. IRRI conducted two communication seminars on effectively reaching target audiences featuring the Development Communication Team from the Philippine Rice Research Institute (PhilRice) and Singapore-based Potato Productions on 11 and 12 September, respectively. Karen Barroga, head of the PhilRice DevComm team, discussed the importance of communication research and how their development communication initiative helped Philrice effectively target their audience. “Communication research is a practice that helps communicators in understanding the dynamics among stakeholders of research,” Dr. Barroga said. Potato Productions, headed by Jonan Loh, presented their strategy for reaching and engaging their target audience in Singapore using traditional print media and augmented reality. Augmented reality creates interactive print by linking videos, slideshows and other visuals on top of everyday print materials. Another highlight of the seminar series was an inspirational talk given by Potato Productions' Emily Teng. Ms Teng (in photo) is also the founder of Blessings in a Bag, a non-profit organization in Singapore that delivers “blessings” to disadvantaged kids and poor rural communities in Southeast Asia. "I've learned that the best way for me to grow as a person is to surround myself with people who are far more inspiring than me, who are heaps smarter, who have incredible stories to share and who are doing crazier things to shake up the world," she said about their group’s visit to IRRI. “We have been surrounded by scientists all day and it's incredible how their work is creating change in things we easily take for granted." The IRRI Communications Seminar Series is an invitation-based forum where communication experts share their experience in their field. The Young Researchers' Lunch hosted Elizabeth Humphreys, head of the Water Science Group, on 18 September. Dr. Humphreys has extensive experience working on crop and water management in South Asia. During the discussion on the different aspects of water management, Dr. Humphreys emphasized that not all water-saving strategies actually result in more water being made available for other uses. Dr. Humphrey, who is also soon retiring, also offered the young researchers some words of wisdom based on her experience working at IRRI. "Enjoy what you do," she said. "It's all about the people." Participants at the event were Jayanta Bhattacharya, Nibir Kumar Saha, Julie Ann Basconcillo, Jianyuan Yang, and Tahir Hussain Awan. The Los Baños Science Community Foundation, Inc. (LBSCFI) named IRRI’s Multiparent Advanced Generation Inter-Cross (MAGIC) Populations in Rice: Progress and Potential for Genetic Research and Breeding as the Philippine Agriculture and Resources Research Foundation, Inc. best research paper at the 7th SyenSaya on 10 – 12 September in Laguna, Philippines. The recognition was given to Nonoy Bandillo, Glenn Gregorio, R.K. Singh, Hei Leung, and Ed Redona, and their team during the awarding ceremony at the SEARCA Umali Auditorium in Los Baños. Every year LBSCFI celebrates the National Science and Technology week through SyenSaya, the Los Baños Science Festival that provides a venue for the community to appreciate and understand the role of science in everyday life. The event also aims to promote Los Baños as a premiere science tourist destination. This year’s theme, Los Baños Science Community: Supporting the nation in meeting global challenges, featured basic science principles, appreciation, and application modules in food and agriculture, technology, development, and the environment. The Heirloom Rice Project, together with the Department of Agriculture Cordillera Administrative Region (DA-CAR), and the Philippine Rice Research Institute (PhilRice), conducted a workshop as part of its effort to develop, implement, and sustain a knowledge management program to enhance the productivity, livelihood and on-farm conservation traditional rice varieties. Thirty four research and LGU staff from the provincial and municipal agricultural offices in Benguet, Ifugao, Kalinga, and Mountain Province, PhilRice, DACAR, and the International Rice Research Institute (IRRI) participated in the Knowledge Management and Capacity Development Workshop on 9-11 September at the Azalea Residences in Baguio City. The workshop covered the role of knowledge management and how it can be integrated with the biological and socioeconomic components of the Heirloom Rice Project. It explored the most effective ways of developing methods and tools for communication collaterals including branding, recognition, and recall; designing of packaging and marketing materials; and photo and video documentation. The participants also developed a one-year knowledge and management plan for their respective province. The Heirloom Rice Project,one of the projects under the Food Staples Sufficiency Program in the Philippines, is supported by the Department of Agriculture, IRRI, and the Consortium for Unfavorable Rice Environments (CURE). Dr. Digna Manzanilla, CURE coordinator, is the co-project leader of the Heirloom Rice Project. CURE spearheaded the workshop and related planning activities. Dr. Lorna Calumpang, CURE communication specialist, facilitated the event. The Closing Rice Yield Gaps in Asia with Reduced Environmental Footprint (CORIGAP) project conducted a Participatory Impact Pathway Analysis (PIPA) workshop for 30 participants from 12 different Thai organizations in Bangkok, Thailand on 8-9 September. The workshop is aligned with CORIGAP’s objective to measure environmental footprint rice farming using ecological indicators. The PIPA workshop is a starting tool to guide the participants in identifying the changes needed to achieve shared goals. Group exercises were conducted to gain a deeper understanding of how various stakeholders are linked (or not) in the collection of data on ecological indicators, what data they need to collect, and where the project could provide support. The group formed a learning alliance and identified topics of interest to be discussed and implemented in 2015. By bringing varied stakeholders together, CORIGAP aims to facilitate coordinated collection of data that can be used to develop policies on optimizing productivity and sustainability of irrigated rice production systems. “We need to gather ecological indicators to help us identify rice farming practices that are environmentally safe and profitable,” said Mr. Chanpithya Shimphalee, the director general of the Thailand Rice Department. The PIPA workshop was facilitated by Engr. Martin Gummert, Dr. Sarah Beebout, Ms. Reianne Quilloy, and Ms. Rica Flor. Rice scientists all around the world submitted more than 700 abstracts for just over 140 oral paper slots in the IRC2014 program. Papers were selected on merit, and among them were 29 papers whose lead authors are Young Rice Scientists (YRS). IRRI celebrated the first Scholars’ Day on 10 September in honor of the 192 undergraduate and graduate scholars who came to the Institute to work on their MS or PhD degrees. Every year, Scholars’ Day will provide IRRI scholars with the opportunity to develop rapport with fellow scholars and enjoy the friendships, diversity, and the living and learning experience during their stay. IRRI’s Training Center hosted the day-long event that started with breakfast with Director General Robert Zeigler and other officials of the Institute. “IRRI is on the right track in attaining the desired number of scholars this year that would significantly contribute to IRRI in achieving its goals,” said Dr. Noel Magor, head of IRRI’s Training Center, as welcomed the group. “IRRI scholars have an important role in making new discoveries and improving the livelihood of rice farmers,” said Dr. Zeigler. He also expressed his respect to the scholars and acknowledged the personal sacrifices they made in order to pursue their advanced education. Meanwhile, Dr. Matthew Morell, deputy director general for research, emphasized the need for scholars to enhance their communication skills. “This will help engage people into their work and help understand the challenges they are facing,” Dr. Morell said. Other activities include a workshop on basic leadership skills conducted by The Center for Leadership and Change; a basic training on presentation skills facilitated by Ms. Ma. Socorro Arboleda, Training Center’s senior specialist; and building online social networks presented by Mr. Gerardo Laviña , Communication’s senior specialist on web architecture and design. Scholars’ Day also featured fun games, dinner, and socials. Since 1964, over 15,000 scientists have been trained to conduct rice research. IRRI scholars have become ministers, secretaries, and heads within the national research and extension systems. Many have also become leading scientists all over Asia. Grant Singleton, IRRI principal scientist, was awarded with the Lifetime Recognition of Excellence during the 5th International Conference for Rodent Biology and Management (ICRBM) on 25-29 August in Henan, China. This special honor was given to Dr. Singleton in recognition of his international scientific leadership in rodent biology and his untiring efforts in promoting the ICRBM around the world. Dr. Singleton presented two papers at the event, reviewing 15 years of ecologically based rodent management and rodent impacts on food security in Southeast Asia. Together with world-renowned ecologist Prof. Charles Krebs, he also delivered the closing remarks where he cited the important issues in rodent biology and management under global change. "The conference highlight was the exceptional quality of the seven plenary talks from world leaders in their respective fields. Emerging topics are the importance of rodent borne diseases in agricultural and peri-urban communities, the use of tools from behavioral ecology to assist in developing more effective management of rodent pests, and that food security demands a resilient agricultural system, which can be facilitated by ‘re-wilding’ crop margins and better preservation of biodiversity in patches of forest in an agricultural landscape," he concluded in his speech. As the current coordinator of the Closing Rice Yield Gaps in Asia with Reduced Environmental Footprint (CORIGAP) Project, Dr. Singleton continues advancing ecologically based pest management through his work at IRRI. Other CORIGAP scientists and national partners also presented papers and posters in the conference. They were Dr. Alex Stuart (CORIGAP postdoctoral fellow), Dr. Nyo Me Htwe (postdoctoral fellow, Myanmar), Dr. Sudarmaji and Arlyna Budi Pustika (Indonesian collaborators), and Dr. Nguyen Thi My Phung (CORIGAP consultant, Vietnam). Around 165 delegates from 25 countries attended the event that convenes every 4 years. This provides the international community the opportunity to exchange information, discuss interdisciplinary studies and promote international collaboration in scientific research on rodent biology and management. The conference was hosted by the International Society of Zoological Sciences. The International Rice Research Institute (IRRI) and its partner institutes in the Greenhouse Gas Mitigation in Irrigated Rice Paddies in Southeast Asia (MIRSA-2 Project) and the Paddy Rice Research Group (PRRG) of the Global Research Alliance on Agricultural Greenhouse Gases (GRA) held their annual meetings at IRRI headquarters on August 18-19 and 21, respectively, to discuss their climate change agendas for reducing the emissions of greenhouse gasses that cause climate change. Launched in 2013, MIRSA-2 is a 5-year research project that aims to develop an improved water management in rice-cropping systems in Southeast Asia using the alternate wetting and drying (AWD) technology. Researches in several Asian countries have shown that AWD can reduce the emission of methane, a greenhouse gas, from irrigated rice paddies by 30% compared with the conventional farming practice. The National Institute for Agro-Environmental Sciences, Japan oversees the overall execution of the MIRSA-2 project, while IRRI provides technical support and synthesis of data. Concurrent with the AsiaFlux Workshop 2014, the project highlighted the results and lessons learned from the first season AWD experimental field trials in four MIRSA sites. Additionally, a proposal for a structured MIRSA database system and formulation of guidelines for measurement, reporting and verification of GHG emission reductions with the adoption of AWD in irrigated paddies were discussed. Ultimately, the MIRSA-2 Project aims to create an implementation guideline on techniques to reduce GHG emissions from irrigated paddy rice fields and set up an information infrastructure to share the findings of participating members. Kazuyuki Inubushi, the designated adviser of the MIRSA project by the Ministry of Agriculture, Forestry and Fisheries, Japan, represented the project donor. Dr. Inubushi met with delegates from the project’s partner research and academic institutions including Hue University of Agriculture and Forestry, Vietnam; Indonesian Agricultural Environment Research Institute (IAERI), Indonesia; Joint Graduate School of Energy and Environment/King Mongkut's University of Technology Thonburi, Thailand; Prachin Buri Rice Research Center, Thailand, and the Philippine Rice Research Institute. In the same week GRA held a meeting to discuss the five action plans set by PRRG. The action plan includes hastening efforts to: 1) standardize measurement techniques; 2) create a database of publications and experts; 3) increase country participation; 4) set-up a pilot multi-country experiment; and 5) build a network for mitigation and adaptation synergies. Research activity reports were presented by the International Center for Tropical Agriculture, Chiba University, IAERI, and IRRI. IRRI is a collaborative partner in the Alliance’s PPRG which focuses on reducing the GHG emissions of paddy rice cultivation systems while improving efficiency production. Ms. Deborah Knox, GRA secretariat, also presented an overview of the Alliance, while Dr. Kazuyuki Yagi, co-chair of the PRRG, presented an overview of the PRRG. The 2014 Asia sub-group meeting of the PRRG was attended by representatives from Japan, Philippines, Thailand, Malaysia, Indonesia, New Zealand, and Vietnam as well as representatives from member countries in Latin America. Launched in 2009, the GRA brings more than 30 member countries from all regions of the world together to find ways to grow more food without growing greenhouse gas emissions. The International Rice Research Institute (IRRI) conducted training on weather data retrieving, processing, and management using an automatic weather observation station (AWOS) on 22-23 August in Myanmar. IRRI provided and installed the AWOS in an irrigated rice field inside the Department of Agricultural Research. Installed before the actual training session, the instrument includes sensors for weather elements, which affects rice growth including temperature, solar radiation, rainfall, humidity, wind speed, and direction. The Institute also provided two tablets for downloading the data from the AWOS. Thirty-two staff from the Department of Agricultural Research (DAR), two from the Yezin Agricultural University, and six from the IRRI-Myanmar office in Yangon, participated in the event. The participants greatly appreciated the training since the country has several extreme environments, where analysis of weather data would be useful, according to Ms. Helen Grace Centeno, coordinator of the Climate Unit at IRRI, and Ms. Justine Bonifacio, researcher at IRRI's Plant Breeding, Genetics, and Biotechnology division. Myanmar’s coastal areas get inundated from time to time while some inland areas are also prone to drought. The 2-day training was sponsored by the IRRI-LIFT (Livelihood and Food Security Trust Fund) project that aims to improve livelihoods of rice-based rural households in the lower region of the Ayeyarwady delta. 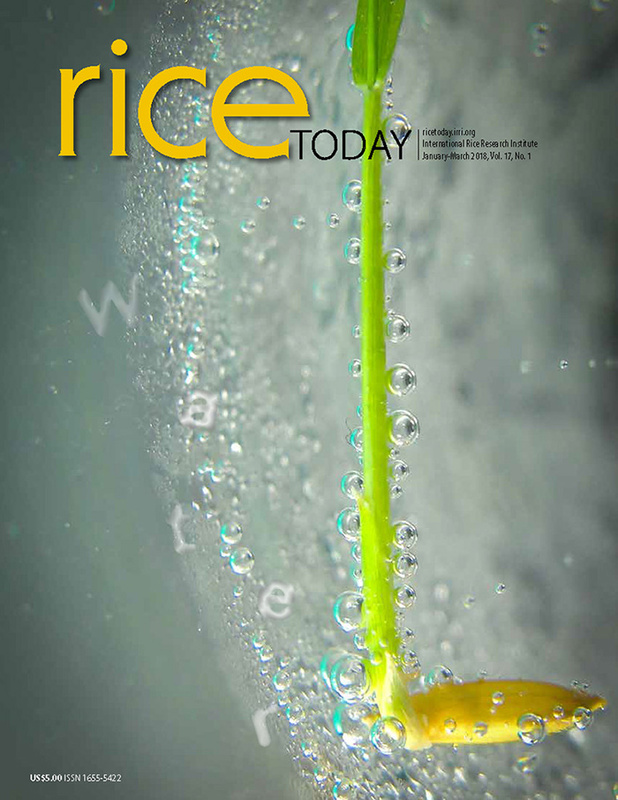 The Indonesian Center for Rice Research (ICRR) held a national workshop on challenges and prospects for technology development in drought- and flood-prone rice ecosystems during the 40th anniversary of the Indonesian Agency for Agricultural Research and Development on August 19-20. At the workshop, scientists from ICRR and the International Rice Research Institute; researchers from the Assessment Institute for Agricultural Technology, the Indonesian Swampland Agriculture Research Institute, and the Indonesian Agricultural Environment Research Institute; extension officers and farmers discussed problems, constraints, existing practices, and possible recommendations for growing rice in unfavorable rice areas. According to Mr. Cartim and Mr. Hambali, two farmers who participated in the event, they were able to get new information such as specific varieties for a particular area and also best management practices for different agroecosystems. Not every farmer could get this opportunity, they said. Drought is a major constraint affecting the rainfed lowlands of Indonesia, especially in northern Sumatra, southern Sulawesi, eastern Java, and Nusa Tenggara. Flooding, on the other hand, predominantly affects swampy areas, which spread to southern Sumatra and Kalimantan. Farmers living in those areas usually own a minimum of one hectare compared with those living in more favorable lands, who usually own less than a hectare. Moreover, this is also becoming a problem in irrigated areas because of the bad condition of irrigation channels, and silting of the rivers surrounding the paddies. Around 80 million—more than half of the country’s 132.57 million people living in rural areas—are estimated to be directly affected by these stresses in the rainfed lowlands. The national workshop was supported by the IFAD-Drought project under the Consortium for Unfavorable Rice Environments. The International Rice Research Institute (IRRI) and Asiaflux co-organized a short training course and workshop where scientists, academicians and entrepreneurs shared scientific knowledge to ensure sustainability of life on earth through flux monitoring. Guided by the theme Bridging Atmospheric Flux Monitoring to National and International Climate Change Initiatives, Asiaflux Workshop 2014 was held on 18-23 August at IRRI headquarters. Dr. Akira Miyata, chair of Asiaflux and director of the Agro-Meteorology Division of the National Institute for Agro-Environmental Studies, explained that IRRI was the apt choice for the activity with its extensive and long history of methane flux study. Methane is an important greenhouse gas that contributes to global warming. IRRI is also recognized as one of the focal points for research of crop science in the world, thus, providing the best platform to promote flux studies in tropical ecosystems in monsoon Asia. Meanwhile, Reiner Wassman, head of IRRI’s climate change research, emphasized that, apart from the provision of tools and information to assess GHG and mitigation programs, how to engage the stakeholders to ensure practicality of results is another important concern. Prior to the conference, a two-day training course was conducted by staff from Campbell Scientific. It focused on the basics and principles of the Eddy Covariance System (ECS), a system to measure carbon dioxide, methane, and heat fluxes between soil and plants and atmosphere. The participants also had a hands-on experience in setting up various ECS and basic programming of the software that runs the ECS. Asiaflux 2014 was supported by the Asia-Pacific Network for Global Change Research, Campbell Scientific, National Institute for Agro-Environmental Science and the National Institute. Dr. Wassman and Ma. Carmelita Alberto, associate scientist at the Crop and Environmental Sciences Division, were in charge of the preparations and activity implementation of the workshop. Asiaflux is a regional research network bringing together scientists from university and institution in Asia to study the exchanges of carbon dioxide, water vapor, and energy between land-based ecosystems and the atmosphere. The organization conducts flux monitoring and data management in Asia, international workshops/conferences, and trainings, and information sharing. The International Rice Research Institute (IRRI) Risk Management and Quality Assurance (RMQA)–Research Data Management (RDM) training team concluded the third RDM 101 course on August 26-28 at IRRI headquarters. The course,which is conducted quarterly. covered all areas of data management including management planning, documentation, collection and pre-analysis of statistical software, storage and backup, and archival and sharing. The training team also discussed and demonstrated file management software Beyond Compare, Cobian, WINDIRSTAT, and Mendeley, and presented an overview of The IRRI Dataverse, an online repository for data archiving and sharing. Mr. Rogelio Alvarez of Information Technology Services provided a lecture on data backup, security and storage. Fourteen participants completed the three-day training course: 8 IRRI staff members, 4 researchers from Can Tho University in Vietnam, a consultant from the IRRI-Bangladesh office, and a scientist from the University of Virgin Islands. The training team is managed by IRRI-RMQA Senior Manager Marichu Bernardo and includes Enrico Mercado and Deacart Arreza. His Excellency the Governor of Tamil Nadu, India and the Chancellor of Tamil Nadu Agricultural University (TNAU), Dr. K. Rosaiah, conferred the Degree of Doctor of Science (Honoris Cause) to IRRI Director General Robert Zeigler during TNAU’s 35th convocation on August 26 in Coimbatore. This exceptional honor was given to Dr. Zeigler in recognition of his contribution to global agriculture research and development. "IRRI and India have been successfully collaborating for nearly five decades," Dr. Zeigler said in his acceptance speech. "India has been actively involved in IRRI’s priority setting, strategic planning, scientific advising, and implementation of research across South Asia. The results of this collaboration have been outstanding and have set an example in international research collaboration." He also praised the partnership between IRRI and TNAU to promote the exchange of information and technology on rice research, farming systems, and value chains for over 40 years. TNAU also presented 133 doctoral degrees, 323 post-graduate degrees, and 1,065 undergraduate degrees to its graduates. The event was attended by the Minister of Agriculture of the State of Tamil Nadu, Dr. J.K. Ladha, IRRI Representative in India and Nepal, and the faculty, staff, and students of TNAU.